The Eagles cannot allow Ezekiel Elliott to do his dumb eating thing. 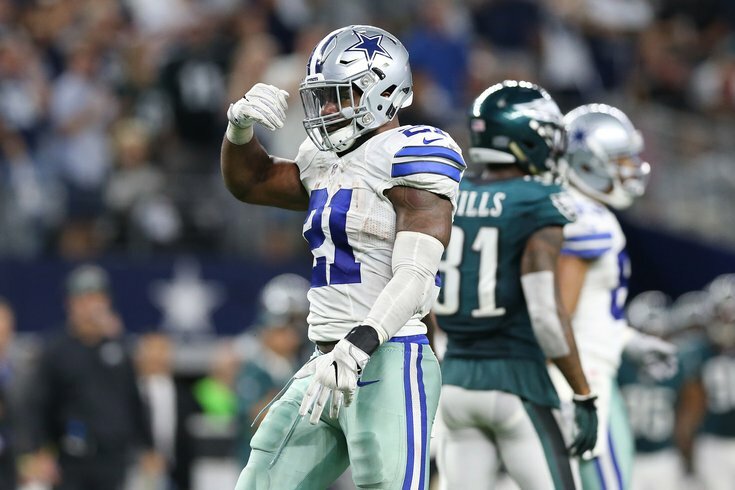 The Philadelphia Eagles should head into Week 10 well rested after their bye week, while the Dallas Cowboys have to travel on a short week after losing Monday night to the Tennessee Titans. While momentum is on the Birds' side after perhaps reviving their season in London, their matchup Sunday night is obviously a huge divisional game, and one in which they must take care of business. In my view, the biggest impact player on the Cowboys' roster isn't Ezekiel Elliott or Tyron Smith, or Zack Martin or (obviously) Dak Prescott. It's Lawrence, who was second in the NFL a season ago with 14.5 sacks, and fourth with 4 forced fumbles. Lawrence hasn't made quite as much noise so far in 2018 (6.5 sacks and 1 forced fumble), but he's still on pace for 13 sacks. Lawrence has a knack for popping the ball out, as you can see in the above video. That's especially concerning against Carson Wentz, whose fumbling issues are well-documented by now. Facing off against Lawrence on Sunday will be Halapoulivaati Vaitai, who will be filling in at RT for the injured Lane Johnson. Doug Pederson and the Eagles staff must find ways to help Vaitai, and not allow Lawrence to wreck this game. UPDATE: Pederson said on Wednesday morning that he expects Lane Johnson to play Sunday night, which would be a remarkable recovery from a Grade 2 MCL sprain, if indeed that diagnosis was reported accurately. I will note that even if Johnson plays, the Eagles should still plan to give him help, as I can't imagine he'll be anywhere near 100 percent. Through the first eight games of the season, opposing offenses haven't even bothered trying to run against the Eagles' defense. To date, the Eagles have faced 150 rushing attempts, the fewest in the NFL by a margin of 20 rushing attempts. The Washington Redskins have faced the second-fewest rushing attempts, at 170 rushes. Opposing offenses have largely recognized that the Eagles' secondary has has been vulnerable, whether that be because they're banged up, or under-performing, or whatever the reason. They've also probably recognized that the Eagles had the No. 1 ranked rushing defense in the NFL last season, and are, you know, good at stopping the run. As such, they've aired it out. The coaching staff is totally unimaginative in their play calling. They have a talented running back to go along with a good run-blocking offensive line. Prescott's star has fallen dramatically after a great rookie season. In addition to Prescott's struggles, the Cowboys still have one of the least frightening wide receiver - tight end combinations in the NFL, even after the acquisition of Amari Cooper. Their passing game has been highly ineffective. Then, as noted above, the unimaginative Cowboys' coaching staff is stuck in 1920. In Amazon's documentary "All or Nothing," which followed the Cowboys' 2017 season from start to finish, Jason Garrett sounds like modern day version of Sean Astin imitating Knute Rockne in Rudy. And then, of course, Elliott is a really good player. Since he entered the NFL in 2016, he's averaging 99.8 rushing yards per game, and he's a weapon out of the backfield as a receiver. Unlike other opponents this season, the Cowboys are going to run the football. They have to. And the Eagles cannot let them get rolling. While Prescott has struggled throwing the football of late, he remains a weapon as a runner. As we've mentioned a few different times this season, the Eagles have given up plays to mobile quarterbacks. "I think the big plays are probably the biggest thing," Jim Schwartz said on Monday. "Quarterback scrambles really fall into like two categories that as a defensive coordinator you get concerned about. One is when they're scrambling for 1st downs, moving the sticks, but we saw Bortles do that, that was probably their best way to move the sticks. And then the other one is explosive plays, those +20 plays, and we've seen some of those. "It's layered in so many different ways. If you blitz, sometimes there's air and there's room for those guys. That was probably more Andrew Luck. Other times you're playing zone and you're defending deeper routes and you're back and then you've got to close space. Each one is a little bit different. But I don't think it's a secret to say that that's one of the things we have to do a better job with. And really in my mind, it falls in two ways: keeping them from scrambling for 1st downs, particularly 3rd-down conversions, and then the long runs, take those off the board." Prescott has been a mobile quarterback that the Eagles have contained, as you can see in the graph above. Still, in 40 career games, Prescott is averaging 5.7 yards per rushing attempt, and he has 14 rushing touchdowns. One of the most overrated thing in sports over the last half-decade or so has been the Cowboys' offensive line. The reality is that they have been a great run-blocking line, but have largely been average in pass protection. In 2018, they still carry an elite reputation among many in media, but they've been so bad this season that they got their offensive line coach Paul Alexander fired. LT Tyron Smith does not look anything like the All-Pro player he once was. Smith only turns 28 in December, but because he entered the league at an extraordinarily young age, he already has 113 starts under his belt. Perhaps the wear and tear of the NFL is catching up with him? LG Connor Williams has looked a lot like exactly that, a rookie. He has struggled, and likely won't play on Sunday night due to a knee injury suffered Monday night against the Jaguars. Xavier Su'a-Filo could fill in at LG. C Travis Frederick has missed the entirety of this season with a rare disease. His replacement has been Joe Looney, who has been a significant downgrade. RG Zack Martin remains a great player, but he has not been as good as he was in previous seasons. RT La'el Collins is a below average starter. In previous seasons, the Eagles' OL, and even their DL, has had to hear about this "elite Cowboys offensive line," and it has fueled them. The Eagles have largely been able to get pressure against this line, and now it's especially vulnerable. The Eagles could be missing three starters -- safety Rodney McLeod, slot corner Sidney Jones, and outside corner Jalen Mills -- against Dallas this weekend if Mills cannot go. Above we already mentioned the struggles of Dak Prescott and the ineffectiveness of the Cowboys' passing game skill players. Of course, earlier this season, the Eagles faced a similarly inept passing team in the Tennessee Titans, who lit them up for 344 yards through the air. It would be ideal if Schwartz has a better plan this week than he did in Nashville.